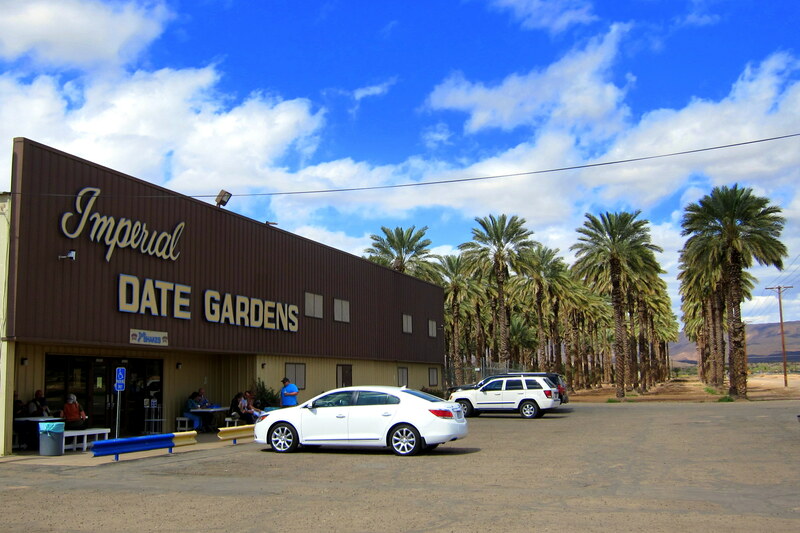 Saturday, February 21, 2015: Up to beautiful blue skies and warm temperatures at Palm Oasis RV Park in El Centro, California. Not being in a hurry, it will be a perfect morning to tackle our pile of laundry…..wish I could help! Sadly, I’m not allowed anywhere near washing machines since the great laundromat disaster or 2009. 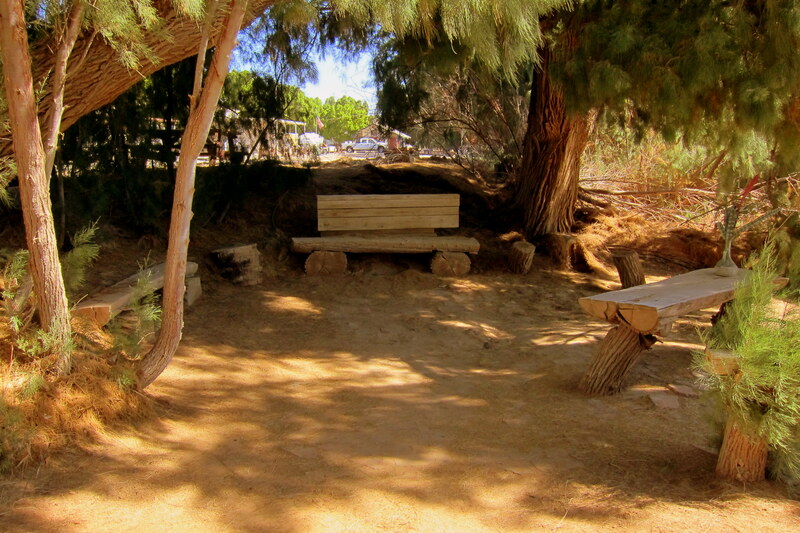 So as Miss Kit sat aside the whirring and burbling machines I took a walk about the RV Park. Unlike normal neighborhoods, campgrounds seem to bring folks out of doors far more often…..there are the morning dog walkers, the health conscience fast walkers, and even folks using walkers. There is always someone in the neighborhood to say good morning to and frequently they are up for some conversation. 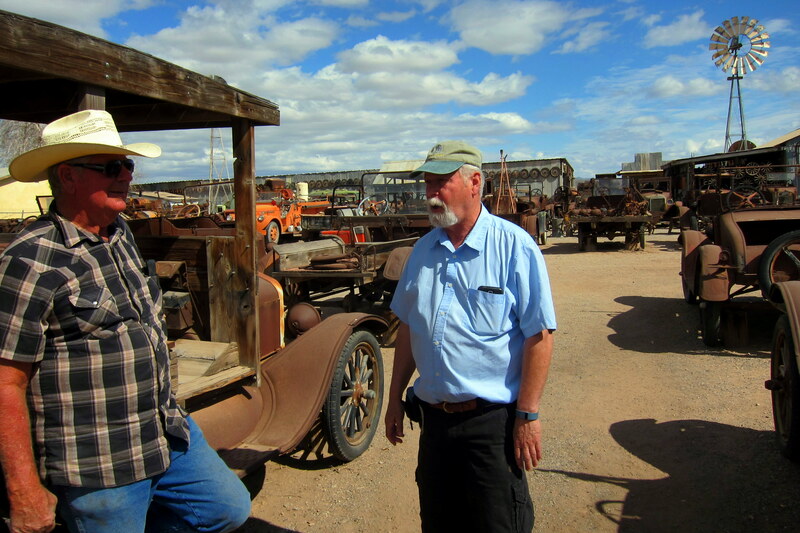 Kit and I have met some interesting characters in campgrounds from all walks of life and have formed lasting friendships with some. I envision it to the way life was in a simpler time before Facebook supplanted the neighborhood sidewalks and backyard fences of America. We are in no hurry today as the travel distance to our next layover is less than sixty miles. So, after ensuring our late departure was not going to inconvenience an inbound RV’r, Kit and I lounged about until finally hitting the dusty trail at one-thirty. 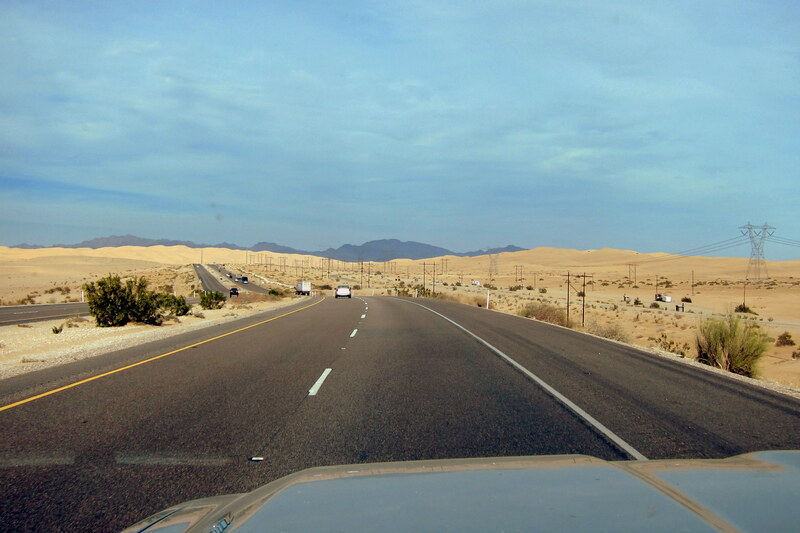 Jumping on I-8 heading east, we skirted the US-Mexican border until arriving at one of many Sothern California snowbird enclaves aptly named Winterhaven. 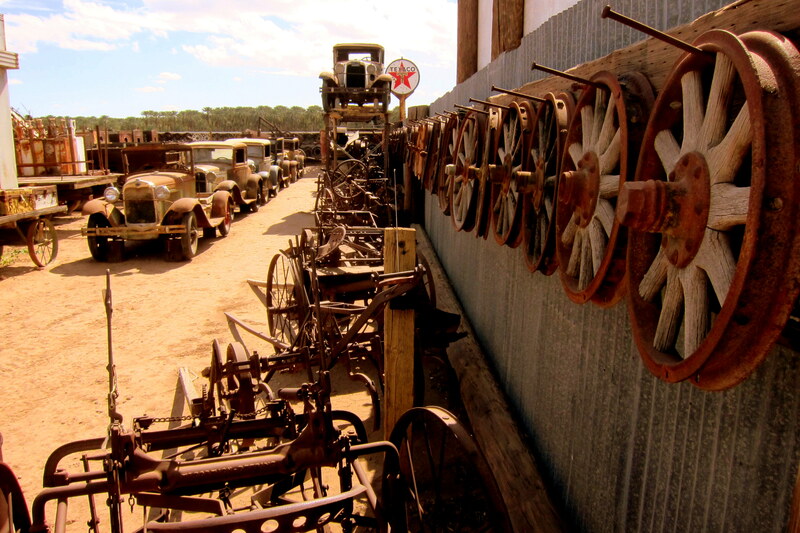 Located adjacent to Yuma, Arizona and bordering the Colorado River, Winterhaven is the most southeastern settlement in California with a population that hovers around 1,000 souls…..mostly retirees from away. Pulling into Rivers Edge RV Park Kit and I set up in a rather tight fitting, but very pleasant, campsite. The photo above is deceiving as there was no one camped in the site next to us. There was a very narrow space between the concrete patio and the utility pedestal, coupled with the narrow camp road and combined with my inexperience in backing a fifth-wheel trailer created a real circus performance……you know, the ones where the trained lions eat the clowns? Fortunately all the nearby residents were napping so missed the spectacle……and, unfortunately all the nearby residents were napping so were not available to move their vehicles out of the road! 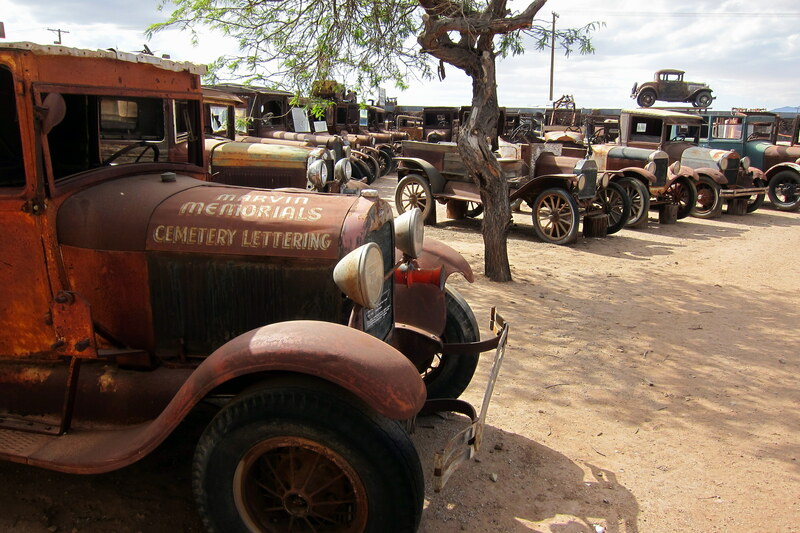 So why did we travel only 58 miles today and stop in a dusty little border town? Well, Kit and I have arranged a special rendezvous with a Maine couple that is heading westerly on their own RV adventure. 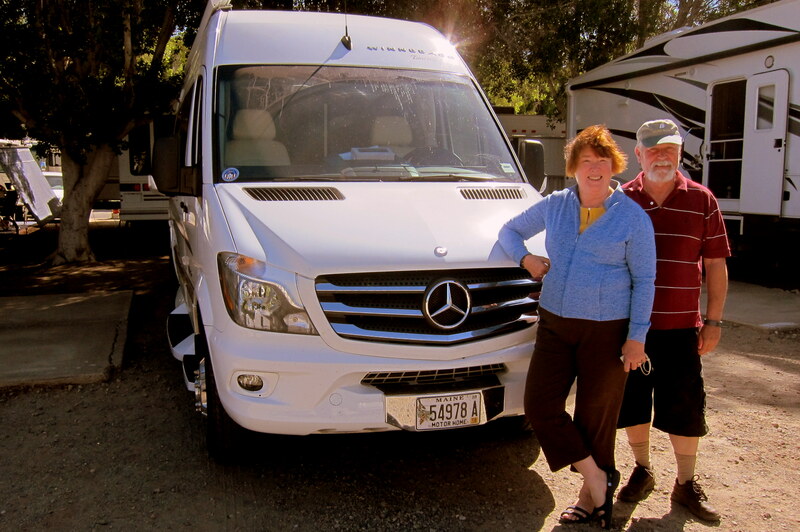 Jeff and Cathy are close friends and fellow square dancers who have embarked on their maiden RV voyage in a class B motorhome. Being that we were on opposing trajectories and coming in from separate time zones, neither of the couples knew when the other was going to reach the campground. Turns out we did by a mere 30 minutes…..which was great as my parking fiasco was unobserved by them so the illusion that I know my way around RV’ing was preserved! It was really great to see Cathy and Jeff and hear about their trip across the US, which we did over Mexican food and cocktails long into the evening. 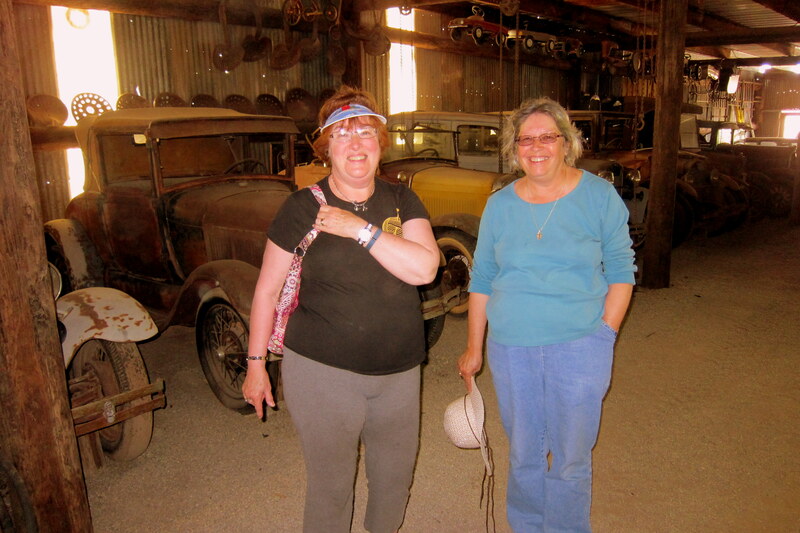 Sunday, February 22 through Tuesday February 24, 2015-Winterhaven, California: Kit and I originally thought of staying a day or two, but ended up extending the visit as we were thoroughly enjoying the company and there was much to see and do. Turns out that this historic facility had significant regional significance and was well worth the time to explore by folks that have little prison experience. 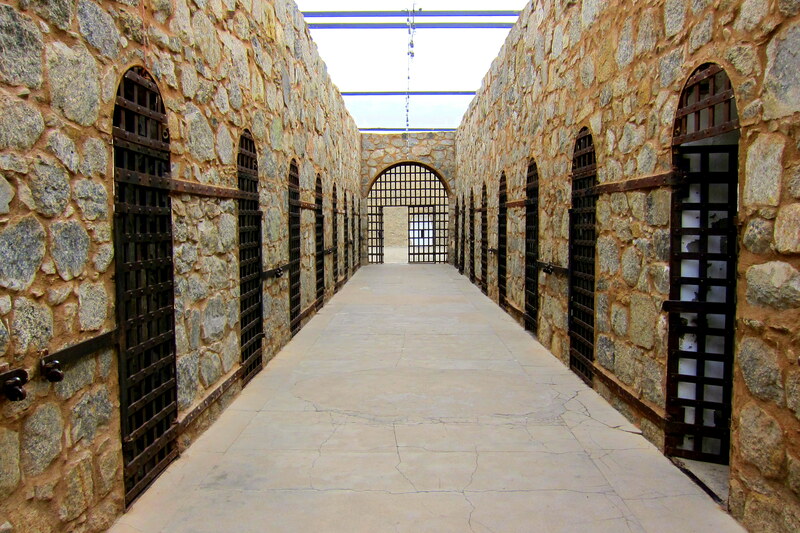 Yuma Territorial Prison was constructed by the forced labor of convicted near-do-wells. These inmates were housed in tents along the Colorado River because there wasn’t yet a proper prison to house them in. Prisoners were told that if they tried to escape their tent-prison that the surrounding quicksand or the hostile Indians would lead to their demise…..so few tried to walk away in the middle of the night. So let’s see, criminals building a facility that will someday incarcerate them…..what could possible go wrong? Turns out that some of the incarcerated laborers added features to the prison that were not specified in the original building plans. These “enhancements” caused a few jailbreaks from the newly completed prison. In addition, one of the inmates, R.L. 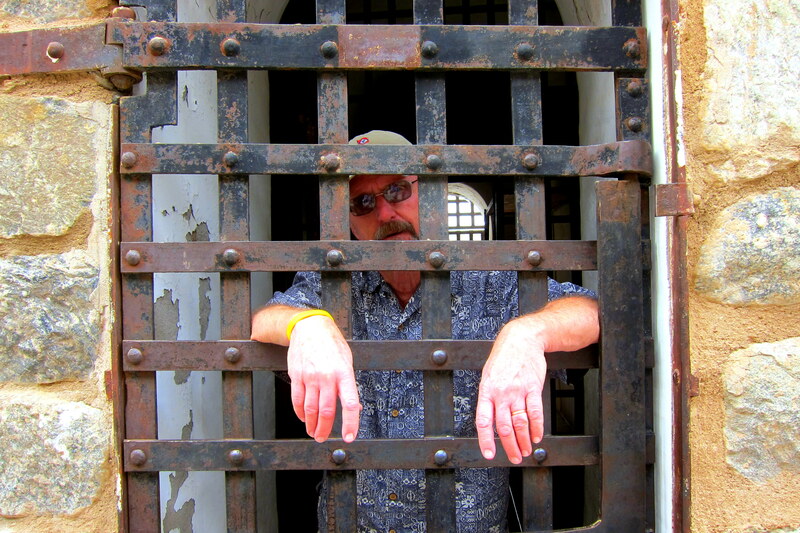 McDonald, an accountant by trade, was sent to the Yuma prison for embezzlement and was assigned as bookkeeper of prisoner accounts…..Yep, he stole $137.00, a fair sum in those days, which wasn’t discovered until after his release. 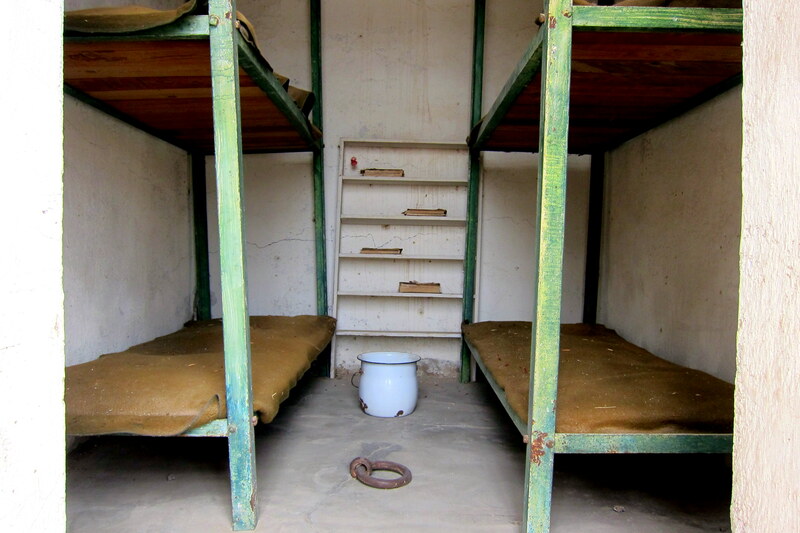 The cells housed six to a room, with a chamber pot in the middle of the floor for “sanitation” purposes. I’m guessing that in the 115 degree heat of summer, it got a might ripe in there! The iron ring cemented in the floor was used to constrain any unruly inmates…..like the meanest contrarian of them all…..Mild Bill Hiccup! Viewing the artifacts and historical documents in the museum, I was struck by the similarities between prison inmates and those of us who volunteered to serve in the military. There was information in the museum that described a prisoner’s introduction to the facility, to wit: “The first day for a prisoner was a busy one. He would be assigned a number, have his vital statistics taken, his head shaved, then photographed and issued a uniform”……the same thing happened to me on day one of boot camp! 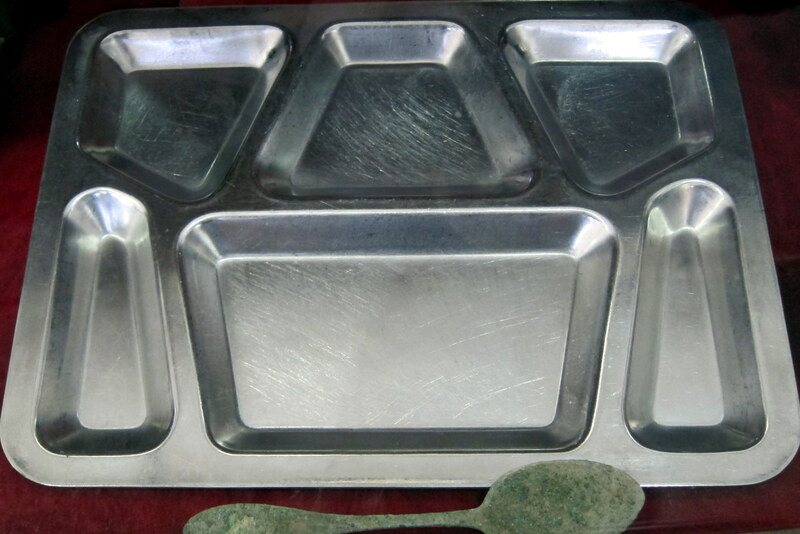 The US military even uses the same dinnerware as prisoners! 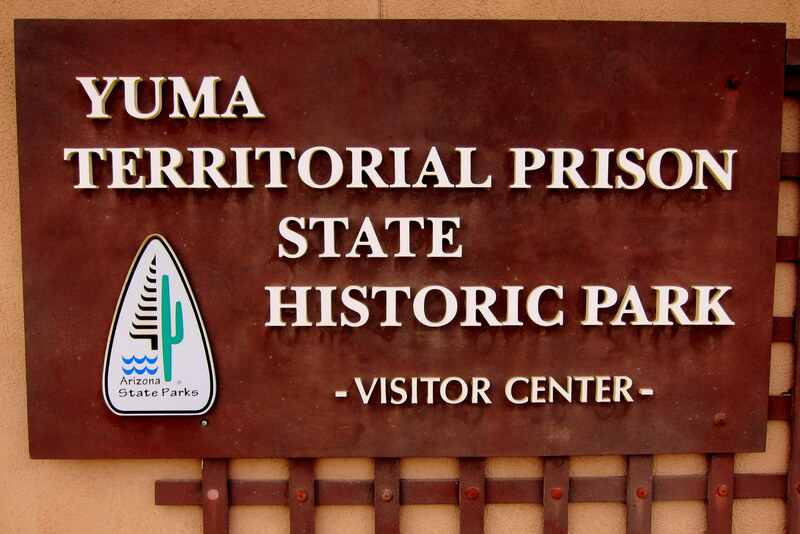 Yuma Territorial Prison and all the personal stories concerning guards and inmates were very interesting…..glad we took the time to visit after many years of blowing right through the area! 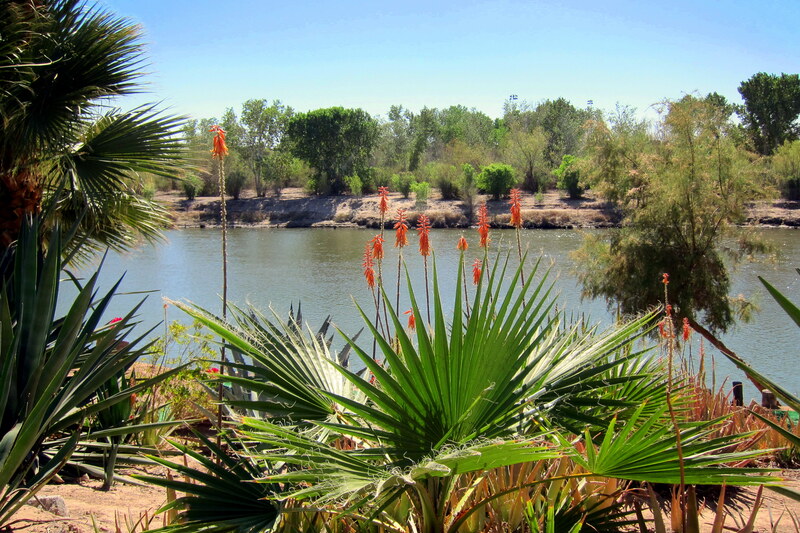 Another interesting factoid about the region, is that in the mid 1800’s Yuma became the prime location for crossing the then raging Colorado River. There were convenient granite outcroppings on adjacent shores and the river narrowed substantially at this point. Later the railroad built the only bridge for 1000 miles and it became known as Yuma Crossing. This provided a convenient, safe and easy way across the river during the US westward migration. 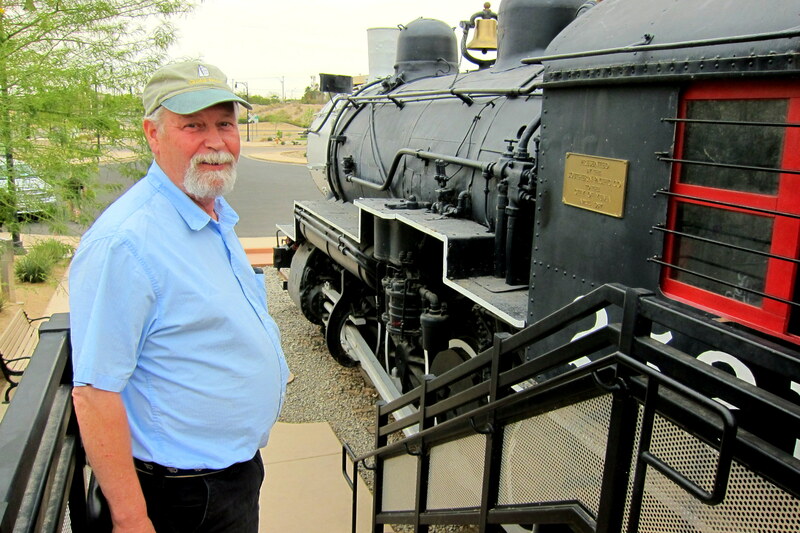 Jeff, a railroading buff, spent time explaining the mechanics and workings of the railroad engine on display at Yuma Crossing National Historic Landmark Park. There is a lot to keep track (no pun intended) of by a train conductor! Just because they don’t need to worry about steering doesn’t mean that the job is a piece of cake! In addition to railroading, Jeff and Cathy are accomplished ocean sailors. So seeing the hull of a large sailing vessel sitting high and dry some 170 miles from the nearest ocean was a sight worthy of a closer look! 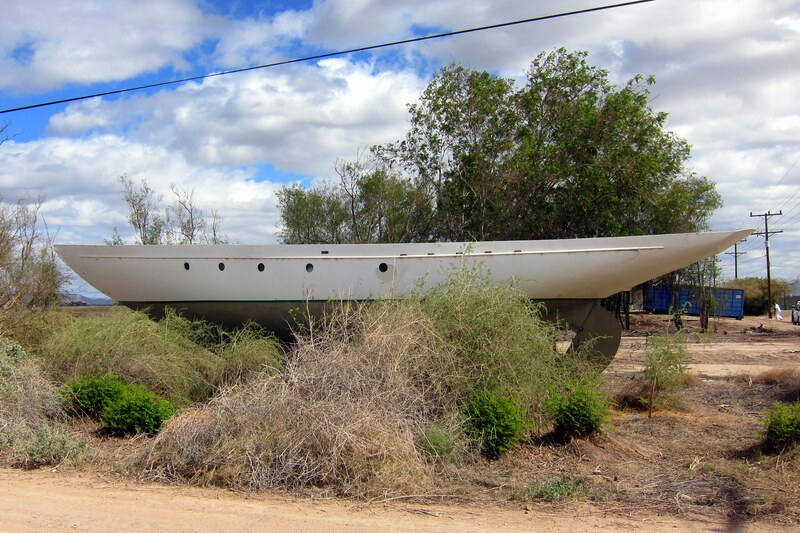 The hull is made of steel and features a large keel and rudder, one that could easily be used in the open ocean! No sign of life was anywhere near the beleaguered vessel…..in fact the only sign was one that proclaimed “Private Property-No Trespassing”. Like many anomalies sighted along the road, this too shall remain a mystery. Date Farms are a common sight in this area. When we mentioned this, Jeff said that a date farm sounded like a teenage boy’s fantasy! 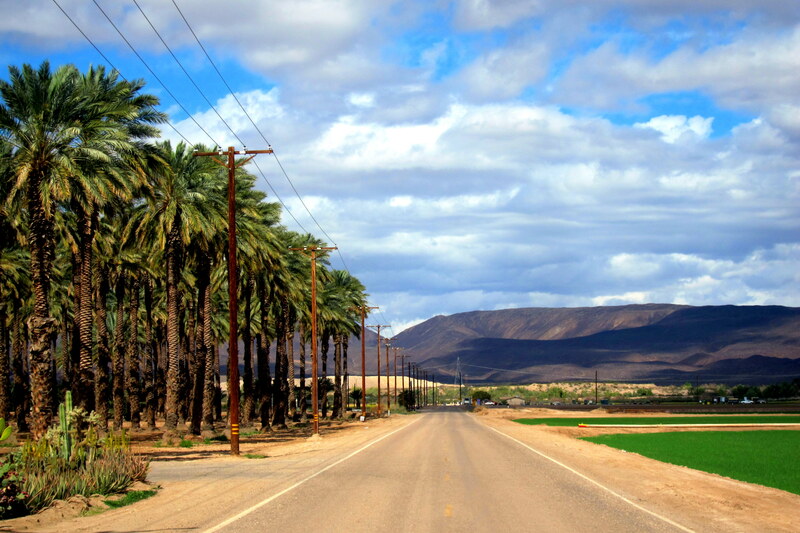 But, in reality, it is nothing more fanciful than a farm that harvests dates from palm trees. And one of the largest in the vicinity is the Imperial Date Garden. Kit and I have been here in the past, and wanted to share with Jeff and Cathy the specialty of the place…..Date Shakes! 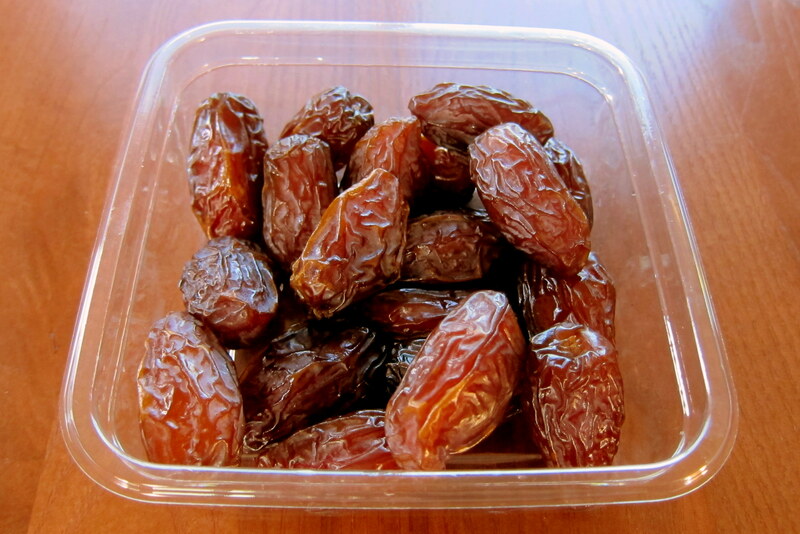 In addition to the sweet and refreshing goodness of the Date Shake, we also stocked up on Raisins, Date Rolls and the delicious Fancy Medjool Dates. We learned a great deal about cultivating and harvesting the date……there is even a job position on the farm known as the “Date Pollinator”! Yea, my inner teenage boy brain giggled as well. 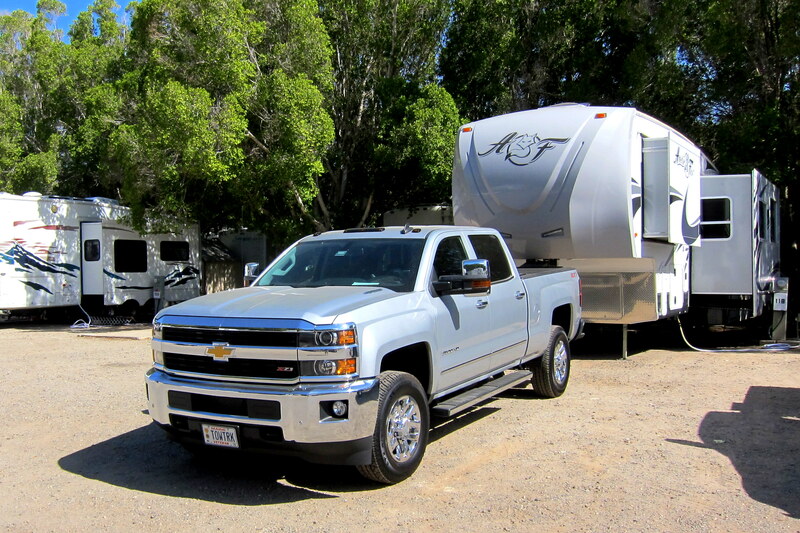 The park we are camping in, River’s Edge RV Resort is, well…..on the river’s edge! The Colorado River parallel’s the campground and there is a nice river walk the length of the park. 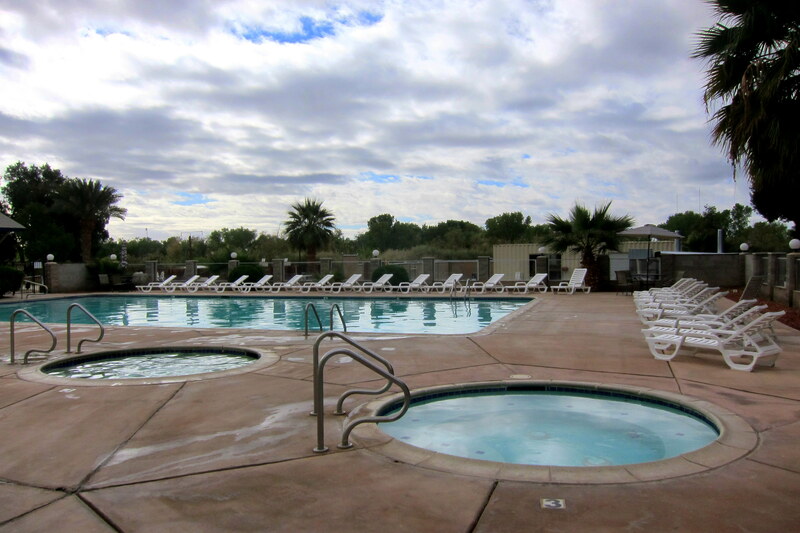 And if chlorinated water is more your style there is a pool and two hot tub’s available. The river bank technically belongs to the US Bureau of Reclamation…..however the residents of Rivers Edge RV Resort have “improved” the steep and muddy shoreline by installing patios and landings along the river to enhance access and recreation opportunities. 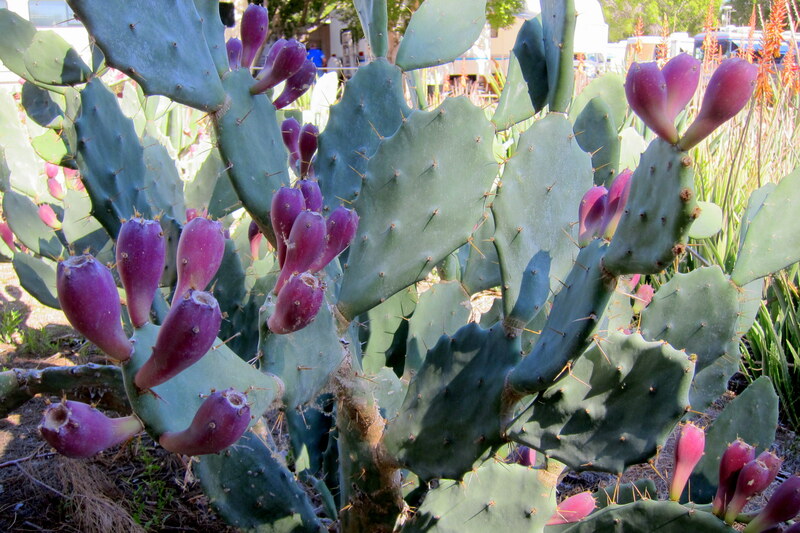 Along the riverbank at this time of the year, many wildflowers and cacti are in bloom like this Prickly Pear. 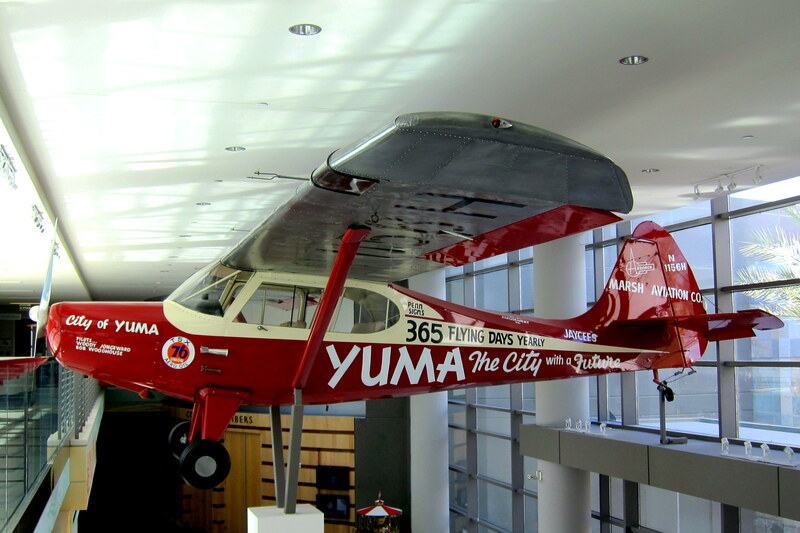 We got wind (no pun intended) of an unusual bit of aviation history displayed in the lobby of Yuma City Hall. This Aeronca Sedan set an endurance record back in 1949 by staying aloft for forty-seven consecutive days. Why was this feat of daring was even attempted? Well, I’ll tell you…..the government had just closed the Yuma Army Air Field which triggered a downturn in the local economy. 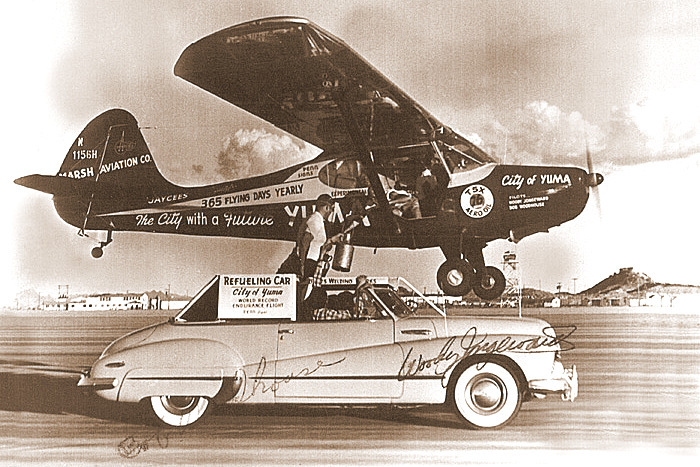 So city fathers (and mother, I assume) hatched a plan to promote Yuma’s perfect flying weather by going after the existing aircraft endurance record of 42 days set earlier that year. Breaking the record, and then some, the little plane set down on October 10, 1947 after flying 89,920 miles…..in circles. Even though the aircraft had a two way radio, much of the ground to air communication was conducted via Morse code using flashlights. Great plan; however the folks of Yuma watching the aircraft day and night got excited by the flashing light from the aircraft and grabbed their own flashlights to flash the pilot back. Mucked up the whole operation! 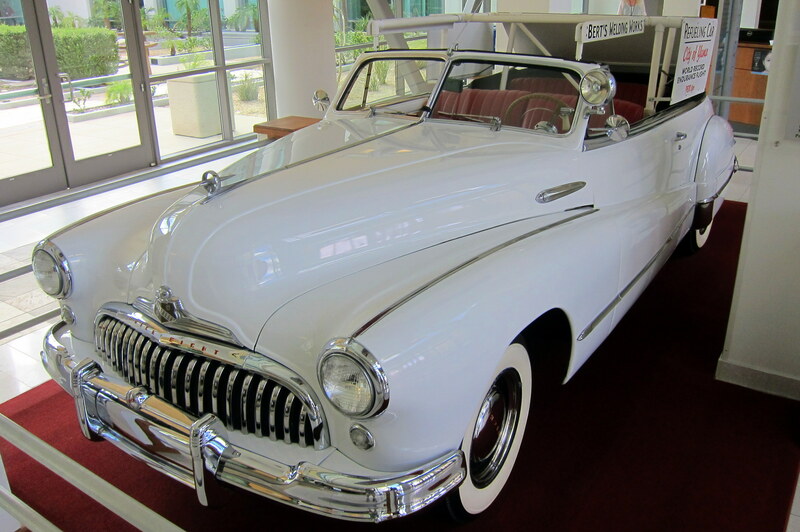 The support vehicle for the effort was a brand new Buick convertible retrofitted with platforms and rails to enable the ground crew to hand up fuel, oil, food and other necessities to the low flying aircraft. Well, the stunt worked as the US Government reopened the airfield and it is now used by the US Marine Corps as an AV-8 Harrier base. As the USMC retires the Harrier “Jump Jet” the Yuma Air Station is being repurposed as a base for the USMC variant of the F-35 Lightening, a Lockheed product keeping my pension out of the red! Ironically the two flyers were Navy combat pilots from WWII. 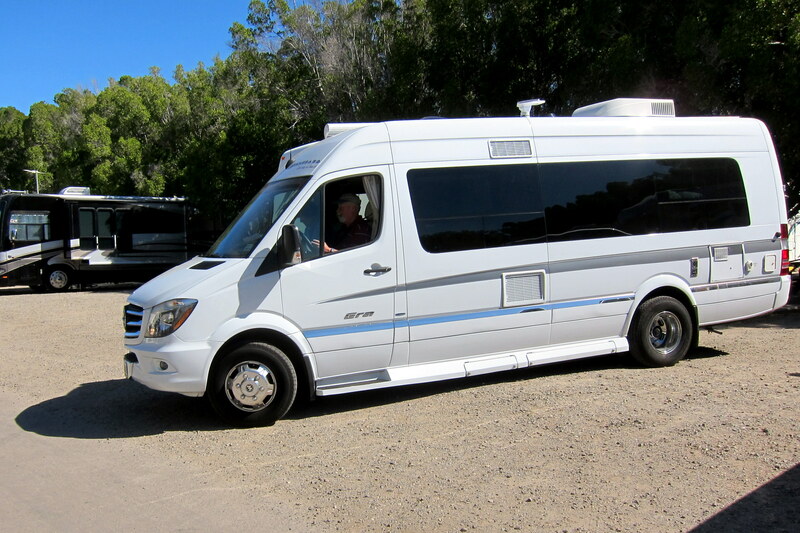 Back at the campground, Jeff and I met our neighbor…..a retired diesel mechanic from Alberta, Canada. Jim has installed a number of innovative accessories to his truck and fifth wheel…..most of which he designed and built himself! Like the dual Honda 2000 generators that are phase synced without the use of the expensive Honda parallel cable. 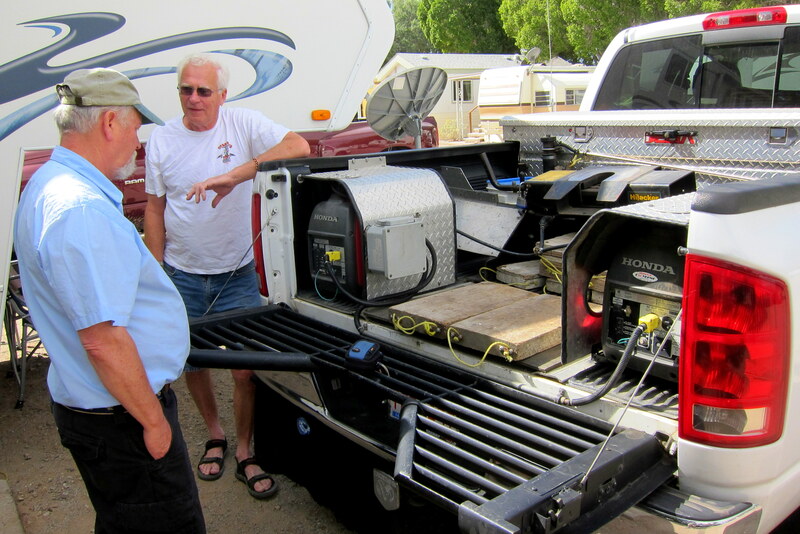 Jim can run one or if needed both generators from their stored position. He also designed and built an auxiliary diesel tank to extend his driving range which also featured an integrated gasoline tank for the generators…..pretty clever! Jeff, I and the girls were out exploring the backroads every day. On one jaunt we ended up at the Cloud Museum. John Cloud has been collecting for the past 16 years, basically anything that strikes his fancy! An old car nut, most of the collection is made up of, what else, old cars! Being kindred old car nuts ourselves, Jeff and I had a blast poking around the old iron……even the girls got into the spirit traipsing about in the many dusty barns on the property. Some of Johnny’s collection had been restored. But, according to Johnny, all arrived here under their own power. 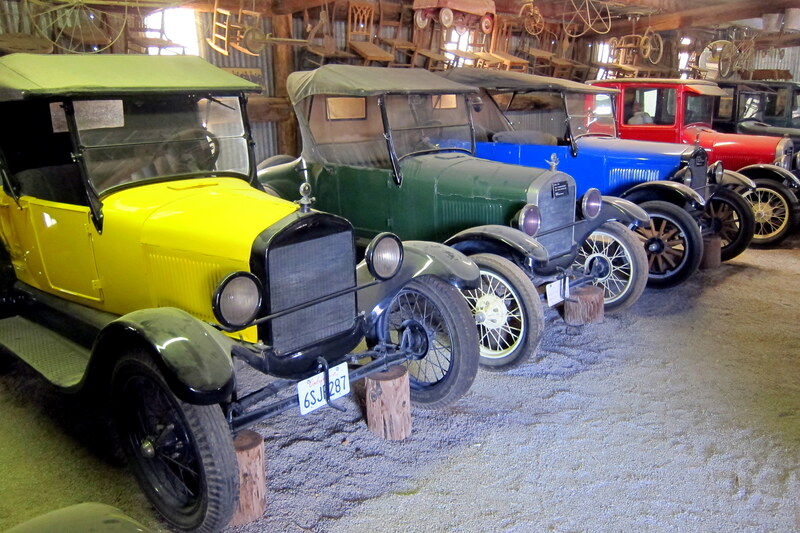 Of particular interest to Jeff, was the collection of Model A’s as he is the proud owner of one of these venerable Ford’s. 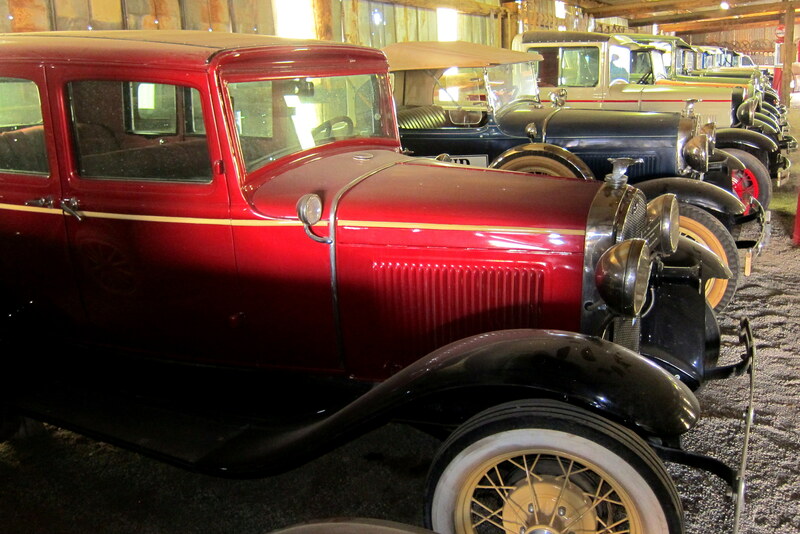 It appears that old Johnny possess an example of every Model A body style Henry ever made! Of particular interest to me was an old motorhome. 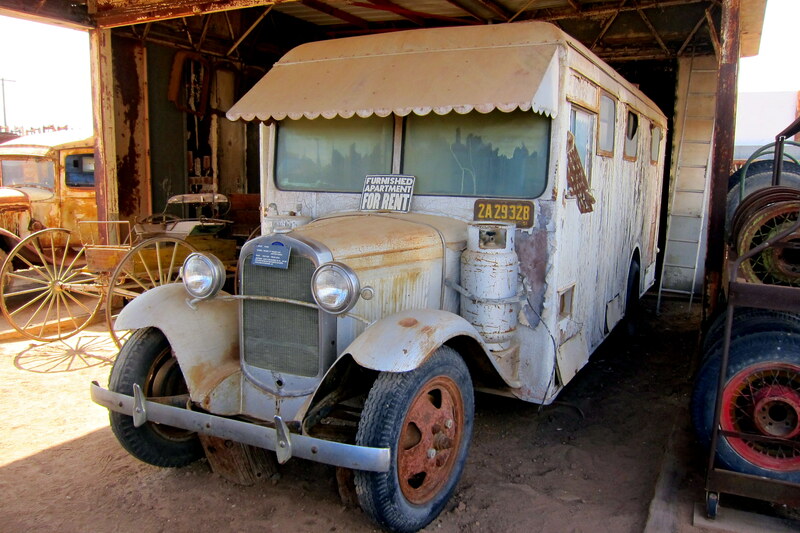 This 1930 Model A “House Car” was purchased by Johnny’s father from an old school teacher in the area and used by the Cloud family for vacation trips. 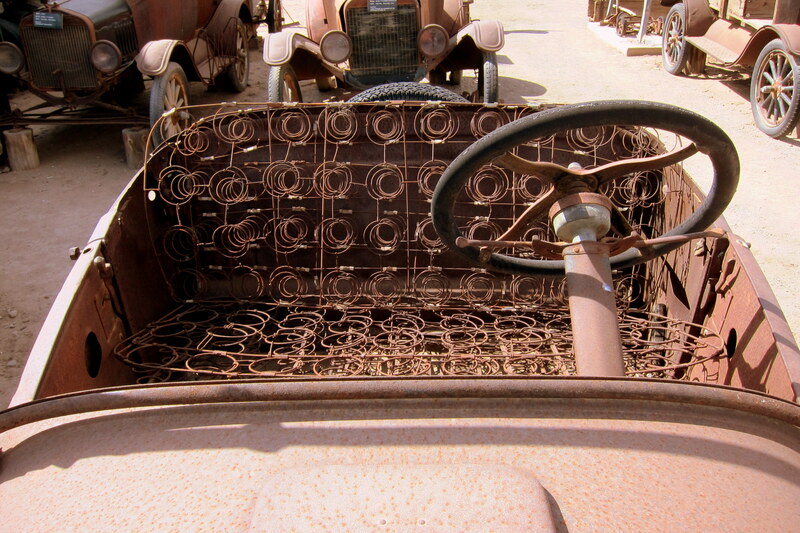 In addition, there were many other pieces of unusual machinery like this contraption. Any of you gear-heads know what it is? Also, here’s a bit of family motoring nostalgia. 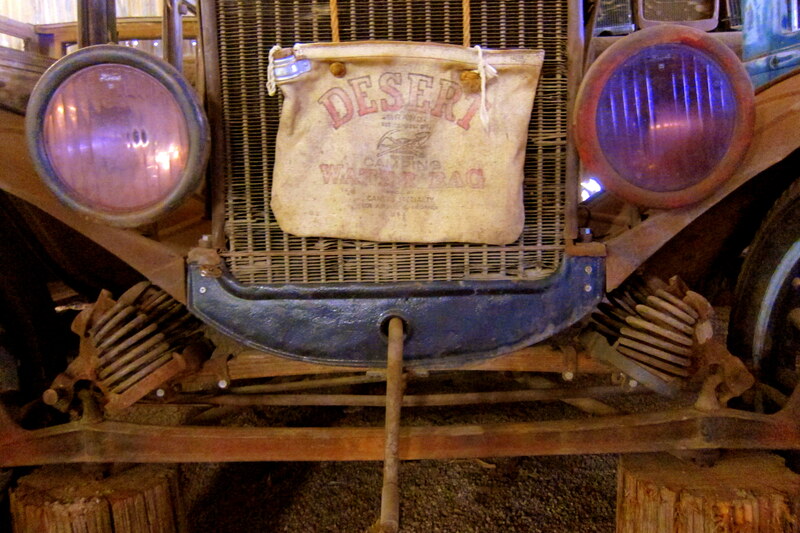 As a kid, whenever we traveled across the desert to see family and friends in Arizona we traveled at night and always had a Desert Water Bag hanging from the front grill of the car. The evaporative cooling of the canvas bag kept the water cool enough to tolerate…..barely. 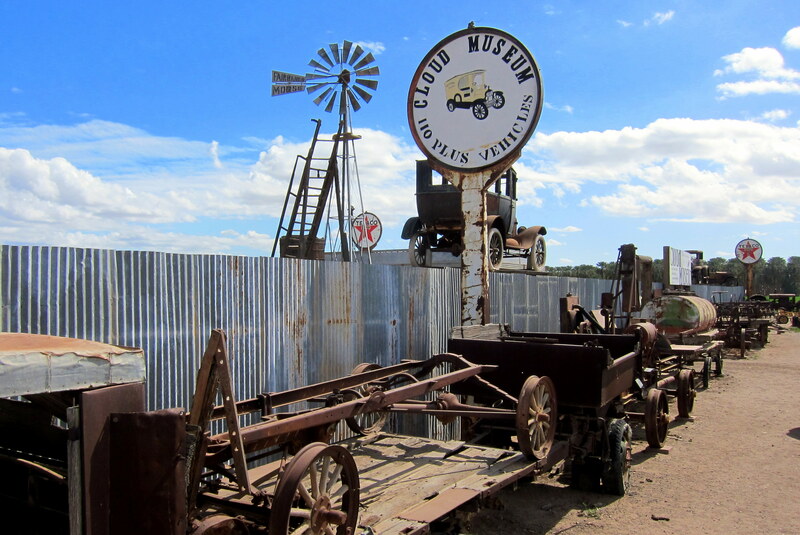 It was fascinating to walk the grounds of the Cloud Museum and catch a glimpse of rusty iron of a bygone age. 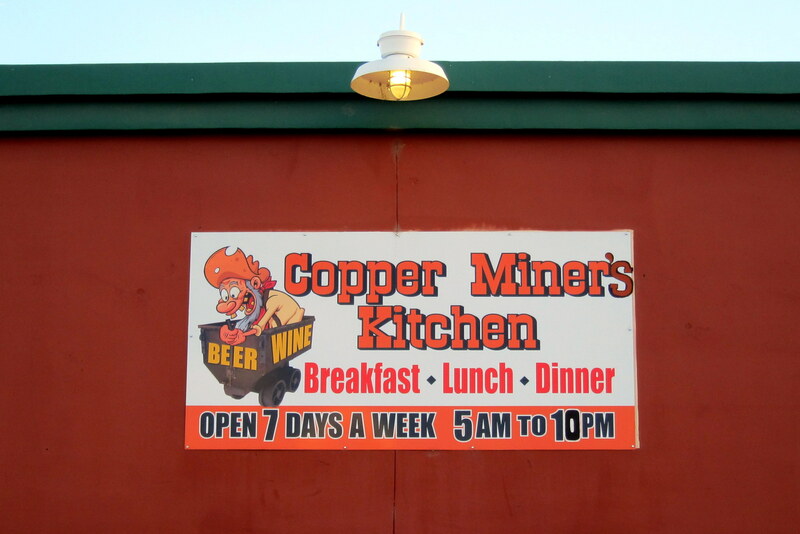 Usually, after a long day of exploration, we would stop at a local eating establishment. 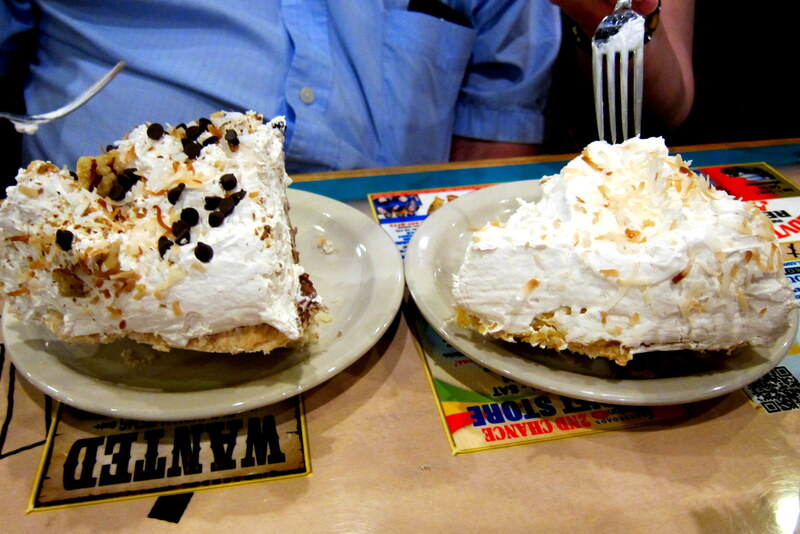 This mom and pop place had some excellent home cooking and an incredible pie selection. Well, alas, Cathy and Jeff needed to motor on, so we bid them fair winds and following seas as they pulled out to continue their trek toward the setting sun. Safe travels friends…..thanks for taking time to camp with us…..see you back in Maine this summer! 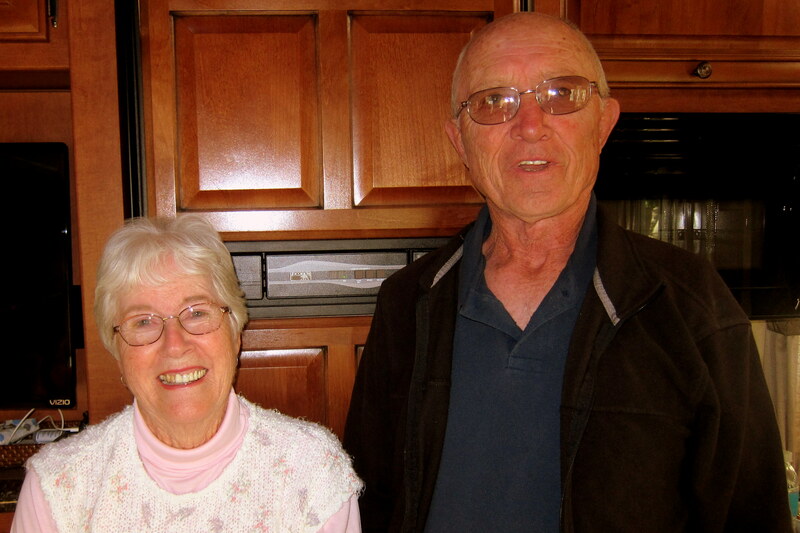 Other longtime friends we try and see when passing through are John Roger and Karen, who escape their home in Bend, Oregon this time every year. They winter over at the LTVA on BLM land (Long Term Visitors Area on Bureau of Land Management land)…..and have for many years. They were one of the reasons we selected the fifth wheel that we did as they have an older version of this trailer and like it very much. It was a blast to see them and catch up on what was new in all our lives. We enjoyed a great meal at Tacos Mi Ranchito and equally nice conversation. An excellent end to our stay in Winterhaven, California and an equally nice sunset on our return trip to the campground. Next stop for Bill and Kit? Stay tuned! Oh…..that yellow machine referenced earlier? 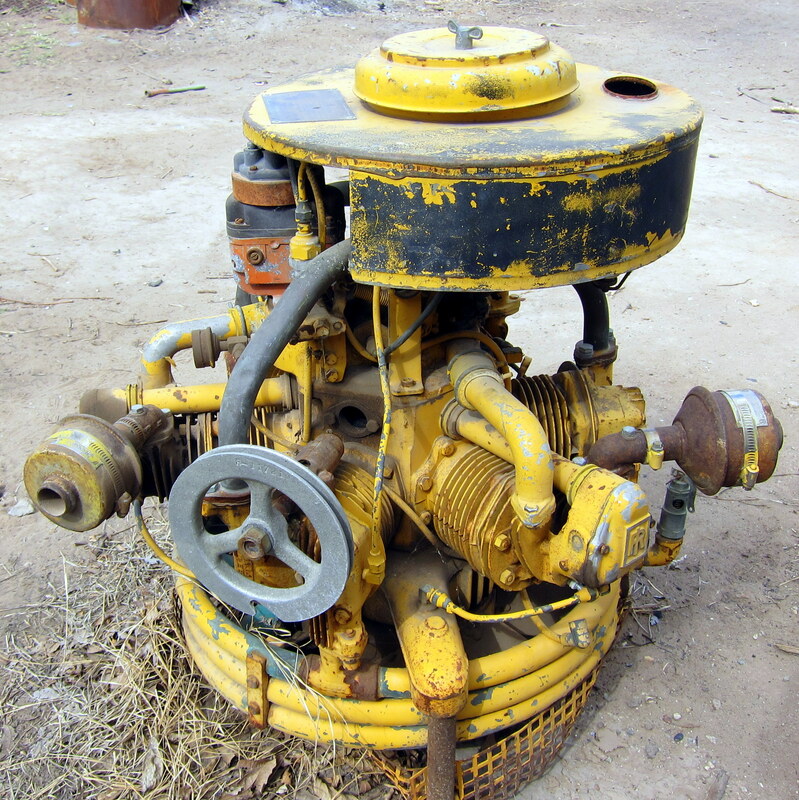 It is a radial engine air compressor made by the Ingersoll-Rand company for use by the railroads. Every other cylinder of the six barrel machine contains a piston that is part of a gasoline engine…..the remaining three alternating barrels contain pistons that compress the air…..pretty neat rig! 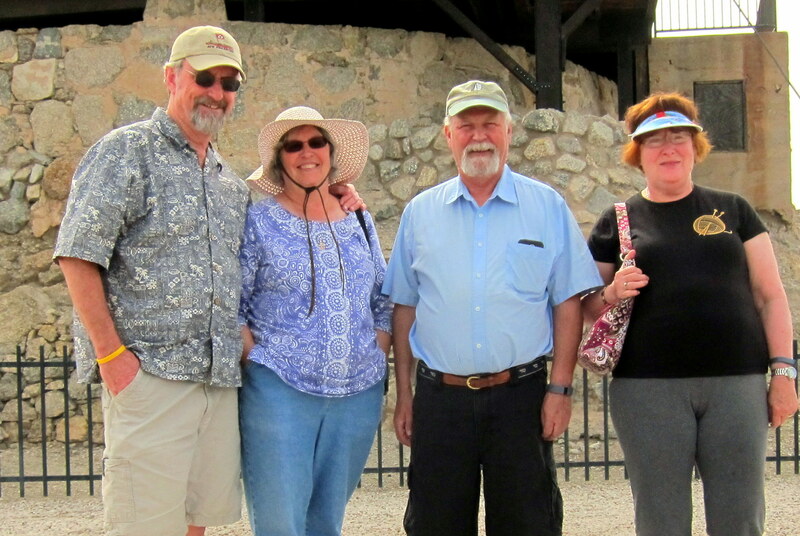 Kit’s Bit’s: We had a great time in Winterhaven, CA/Yuma, AZ! Of particular interest was the prison tour. Back in Feb. of 1976, we had stopped at a roadside rest to stay overnight in our first trailer with all 3 kids. We only stayed a few hours and never really got out to see what was around the area. That was our very first “non-campground” stop ever! We were on our way to Norfolk, VA and, of course, taking the “scenic route”. It was nice to finally see what the place was all about. Great to catch up with Cathy & Jeff! We were able to compare notes and do some sightseeing around the area. 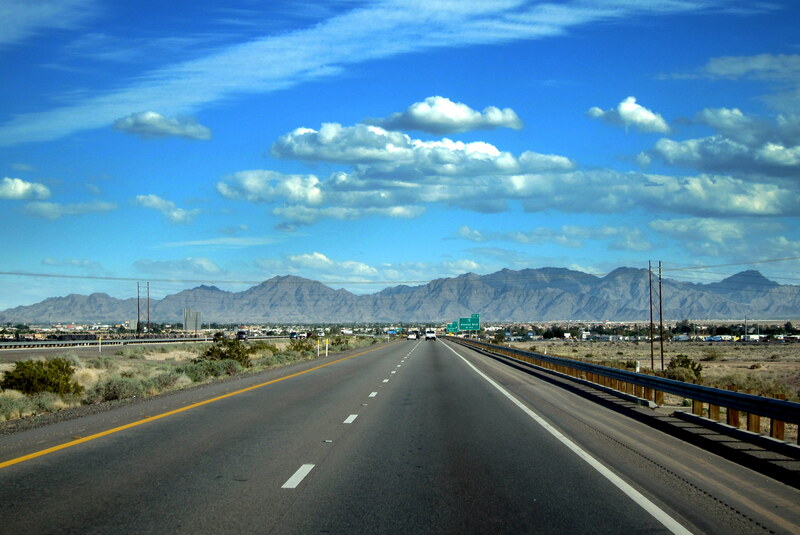 Often, people who live in greener parts of our country are fascinated by all the desert has to offer. 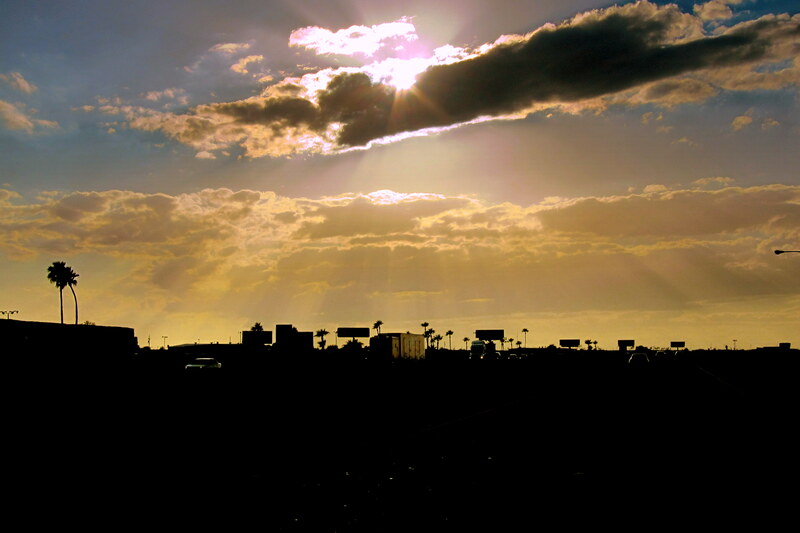 The desert is particularly nice during the winter. Also great to catch up with John Roger and Karen! They are experts in the ways of BLM camping! Great reading your blog! Enjoyed seeing pictures of you and also Karen and John Roger. We will be seeing them in just a couple days as they park across the street from our lot in Fulton, TX. FYI, the square dance group dances here on Wednesday evenings if you are ever in the area. Mild Bill Hiccup?? Cute! I was just telling Rod, I didn’t know Yuma had so much history. We always look forward to reading and seeing your adventures.